Stop the negativity before it brings down productivity and morale! 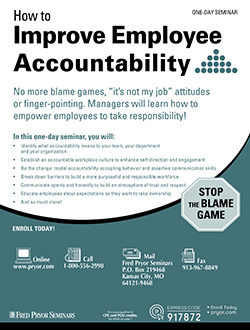 This seminar will help you learn to flex your managerial skills to get everyone to pull together and work side by side to achieve the organization's goals in the most efficient, productive way possible. And the best part: the company benefits because overall productivity and morale increases. Also, an accountable workforce basically manages itself! Imagine being freed up to focus on something other than day-to-day drudgery and disciplinary issues. Employees benefit because they are empowered and held accountable for their own success and that of the company as well. They will look forward to more challenges and increasing company profitability. What does accountability mean to you and your organization? How do you communicate in a culture of accountability? To create a culture of accountability, you need to be resolute in your efforts and prepared for open communication. There will be questions and you will be ready with the right answers at the right time. What are some obstacles you will need to overcome? The only thing that is constant is change. Yet, as creatures of habit, it is change that impacts us most. It may even scare us. It should be no surprise that with this new culture of accountability, there will be roadblocks to change. Be ready. How do you maintain an accountability culture? Once you have an accountability culture in place, it is paramount to prevent backsliding to your previous ideology. You need to stay on top of the change cycle. Review and analyze performance. Reward success and be sure to accentuate the positives of this new practice.